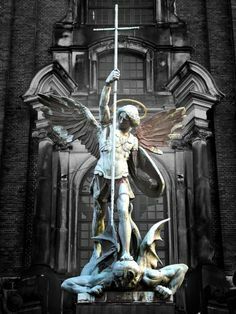 Artwork, such as this statue from St. Michael’s Church, Hamburg, Germany, portrays St. Michael casting out Lucifer, aka Satan, Father of lies, Devil etc., as recorded in Revelation 12: 7-12. Artists have added the Cross to the Scripture passage, though not recorded in Holy Writ in the Revelation passage. Yet, it is true: by Christ’s death and resurrection, the devil is put to flight in the Lord’s mercy toward us sinners. Everlasting God, You have ordained and constituted the service of angels and men in a wonderful order. Mercifully grant that, as Your holy angels always serve and worship You in heaven, so by Your appointment they may also help and defend us here on earth; through Your Son, Jesus Christ, our Lord, who lives and reigns with You and the Holy Spirit, one God, now and forever. Reflection on Revelation 19: The angel said to me, “Write this: Blessed are those who are invited to the marriage supper of the Lamb.” And he said to me, “These are the true words of God.” 10 Then I fell down at his feet to worship him, but he said to me, “You must not do that! I am a fellow servant with you and your brothers who hold to the testimony of Jesus. Worship God.” For the testimony of Jesus is the spirit of prophecy. Hebrews 1: 14: Are they (angels) not all ministering spirits sent out to serve for the sake of those who are to inherit salvation? God’s Word is clear. When angels bring God’s Word to mortals, there is knee-knocking fear. This is why Gabriel first had to say to Mary, Fear not. Yet, the Scripture is equally clear: angels are humble. As it is written in Revelation 19, when John wants to worship the angel, the angel is clear, “You must not do that!” Angels and saints in heaven are not to be worshiped, that is, prayed to and invoked, as too many churches do to this day. I am a fellow servant with you and your brothers who hold to the testimony of Jesus. Worship God. Angels which are luminous servants and messengers of the Most High, are our fellow servants! Angels hold to the testimony of Jesus. Further, we read in Hebrews angels serve us mortals. Mortals, who by God’s grace in Jesus Christ, received through faith in the work of the Holy Spirit, are inheritors of salvation. I think when popular articles about UFOs and ETs, begin with, “we are not alone”, it is strange and sad science fiction comfort that is sought: we are not alone in the vast universe. But the Lord has told us this for centuries, the millenia: we are not alone. His angels keep us safe and watch over us, serving us frail mortals. The angels know they did not die for sinners. The angels saw what happened when one of their own wanted to be worshiped as God, that is, Lucifer (literally, light bearer). The angels know that God’s own Son did not die and rise for them, but for the Sons of Adam and the Daughters of Eve, who fancy themselves as ‘stars’, wanting to be “like God”, following the angel hosts’ fallen brother’s lie (see Genesis 3). Again, the name Michael means, “Who is like God?” Answer: not Michael, but the Son of Joseph, the Son of God. The angels know they can not bring another Gospel (see Galatians 1:8), but they give witness to the Gospel of the Son’s Crucifixion and Resurrection, the “eternal Gospel”, for us all to see and come to faith, see Revelation 14:6. We are not alone. This is comfort to the Lord’s redeemed people that God is One, yet the Lord is not alone. “Glorious is God with His angels and saints, O Come, let us worship Him” (invitatory for daily prayer). The Lord, the blessed and holy Trinity, wants His kingdom filled with the redeemed. I was reminded this morning of a Biblical insight in an eloquent article by Chad Bird, “How a Small Rural Congregation Became a Megachurch Overnight”. It is clear in Revelation that the angels with mortals worship the Lamb upon His throne. The Biblical insight is that when we tally how many were at worship on a given Sunday, we can not count, “angels and archangels and all the company heaven, lauding and magnifying Thy Holy Name, ever more praising Thee and saying, HOLY, HOLY, HOLY, LORD GOD OF SABOATH , HEAVEN AND EARTH ARE FULL OF THY GLORY. HOSANNA IN THE HIGHEST.” (part of the prefaces in the Divine Service). We are not alone, we are baptized into a holy communion. A blessed Feast Day to all!